Most teams have eclipsed the 20 games played mark and have the first quarter of the season in their rear view mirror. Some teams have had a better first 20 than others, but every team has something they should be thankful. 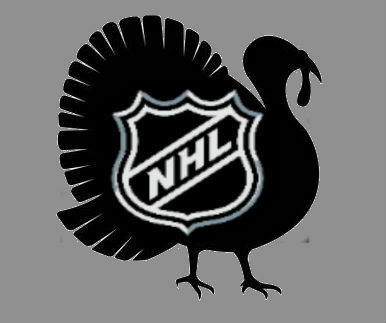 So, in the spirit of Thanksgiving here is a team-by-team look at what each team should be thankful for at this point of the season. Anaheim Ducks: Teemu Selanne continues to forget that he is 41-years-old, scoring seven goals and recording 12 helpers for 19 points in 21 game played. Boston Bruins: The Bruins have rebounded from their 3-7 start, and have won ten in a row. Buffalo Sabres: With Ryan Miller's shaky start, back up goaltender, Jhonas Enrtoh, has performed great, posting a .931 save percentage and 2.06 goals against average. Calgary Flames: Sure Jarome Iginla and Brent Sutter might be feuding, but hey Iginla scored last game, his first in three games, that should calm things. Right? Carolina Hurricanes: Jeff Skinner seems to be immune to the sophomore slump grabbing 21 points in 22 games played. Chicago Blackhawks: The Blackhawks sit in first place in the Central Division with 27 points, and Patrick Kane's wrist seems to be just fine. Colorado Avalanche: Two words. Matt Duchene. Columbus Blue Jackets: Mmmmmmm, ugh, well they won back-to-back games and had a shot to make it three straight when they took the Devils to a shootout last night. Dallas Stars: The stars have gone 13-8 in their first 21 games played and have most thinking, Brad Richards who? Detroit Red Wings: Captain, Nicklas Lidstrom, will be wearing a Red Wings sweater for at least 62 more games. Edmonton Oilers: Ryan Nugent-Hopkins has grabbed eight points in his last three games and 22 points in 21 games. Florida Panthers: The Panthers are on a three game win streak and are number one in the Southeast Division with 27 points. Los Angeles:Kings: Anze Kopitar has picked up where he left of last season notching 24 points in 22 games played. Minnesota Wild: At the 21 game mark, the Wild find themselves atop the NHL with a 13-5-3 record and 29 points. Montreal Canadiens: Hey the NHL just launched the French version of NHL.com. French Canadians rejoice! Nashville Predators: The Preds have star goaltender Pekka Rinne locked up for the next seven years. New Jersey Devils: Travis Zajac is close to returning, and Martin Brodeur can still make saves like the one below. New York Islanders: There is not one player on the active roster with a positive plus/minus, oh wait. Mmmmm John Tavares has 16 points in 19 games! New York Rangers: Ryan Callahan, the Rangers' captain, leads all Rangers forwards with 24 blocked shots, and is second on the team with 49 hits. Is there a harder worker on the Rangers? Ottawa Senators: Their is a possibility four Senators will start in this years All Star Game at Scotiabank Place. Philadelphia Flyers: Claude Giroux is developing into one the leagues finest, 27 points in 21 games played, and Jaromir Jagr is showing that he's still got it with 17 points in 19 games. Phoenix Coyotes: Be thankful there is still a team in Phoenix. Pittsburgh Penguins: Three words. Crosby is back! San Jose Sharks: The Sharks sit atop the Pacific Division with 27 points, are on a four game win streak, and have at least one game in hand on the entire Pacific Division. St. Louis Blues: They get to play the Columbus Blue Jackets six times from now until the end of the season. Tampa Bay Lightning: Steven Stamkos is on a point per game pace, 20 points in 20 games, and the Lightning have a pretty sick goal celebration. Toronto Maple Leafs: Toronto is currently tied for first place in the Northeast Division with 26 points and has Phil Kessel, 30 points, and Joffery Lupul, 26 points, to thank for that. Vancouver Canucks: The Canucks seem to have found their stride going 3-1 in their last four games, and Daniel Sedin has 24 points in 21 games. Washington Capitals: The Caps are an impressive 8-1-1 at home, and play four of their next five games at home. Winnipeg Jets: The start to the Jets' new NHL lives hasn't been ideal, but hey hockey is back in the 'Peg and that alone is reason to rejoice.